People tend to zero in on media relations and social media when they think about public relations, but there are so many other ways to engage and connect with audiences. Corporate events, in particular, can turn a good campaign into a great one by creating authentic, direct touch points for audiences to interact with your brand. Congratulations to our client and friends at Dallas Fort Worth International Airport, who officially launched the entity’s new brand this morning. Blake, Ashley and I were there for the big brand reveal – complete with an unveiling of the new logo, media interviews and plenty of photo opps. But the truth is, while the public first saw DFW’s new logo and look today, passengers, media and influencers have been introduced to the new brand for several months now. You see, DFW Airport did branding right. It’s not about a logo. It’s bigger than Pantone colors. A true rebrand is a refreshing of the organization’s approach to its business. Since CEO Sean Donohue joined DFW in 2013, he, the board and his leadership team have been aggressively pursuing excellence at the world’s fourth busiest airport. In three years, Sean has added several new international routes, giving Dallas Fort Worth residents (and tons of connecting passengers) access to destinations like Hong Kong, Beijing, Abu Dhabi, Dubai and all over the world. If you’ve been to DFW recently, surely you’ve noticed the major renovations that are finishing up, thanks to the TRIP program. Follow @dfwairport on nearly any social media channel, and you’ll notice an immediate and personal response to any comment – whether positive or negative. And, this year, the Airport hired a new senior vice president totally in charge of improving the customer experience. Now that is a rebrand. So, again, congratulations to DFW Airport on the public launch of exciting changes that have been in the works for some time. We’re looking forward to journeying with you and our other agency partners – including Alpha Business Images, MRR & Associates and The Marketing Zen Group – on this new brand path. Be sure to follow DFW Airport’s on Periscope for videos of today’s event and more to come! When your client opens 14 new stores in one city, it’s big news. 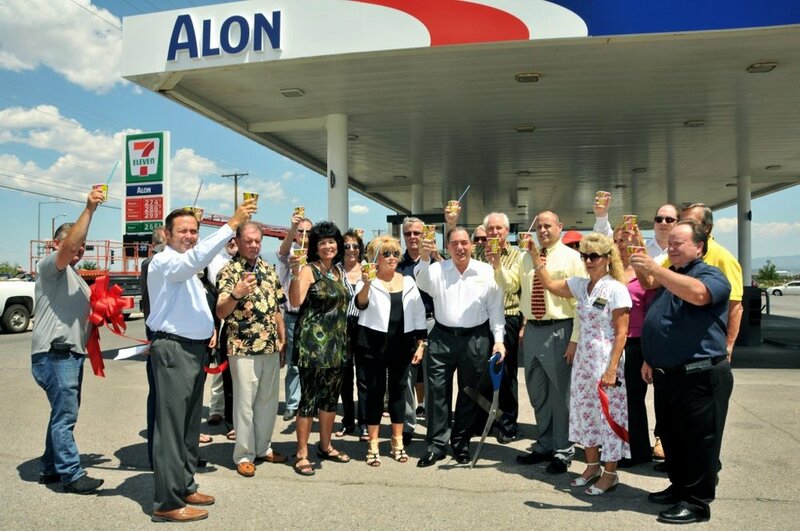 This week, Alon Brands acquired 14 new stores in the Albuquerque area from family-owned Roberts Oil Company. 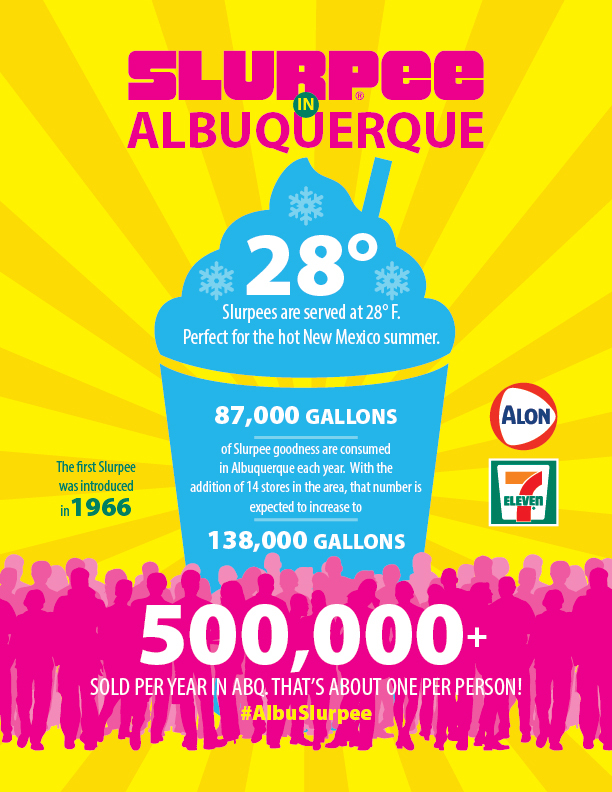 The acquisition expands the ALON/7-Eleven footprint by more than 50% in Albuquerque, bringing the total number of stores in the area to 38. That’s a lot of Slurpees! This expansion is part of a significant investment Alon Brands is making in the Albuquerque region. The company just finished remodeling all of its locations in the area and built a brand new store in Rio Rancho (see: Putting the Grand in Grand Opening). LPR helped Alon celebrate the acquisition and recognize Roberts Oil for its 40+ years in business by coordinating a ribbon-cutting and Slurpee toast with the Roberts family and the Albuquerque Chamber. The acquisition story was both newsworthy and interesting to local and industry media, gaining coverage on KRQE-TV, The Albuquerque Journal, Albuquerque Business First, as well as Convenience Store News, CSP, and Convenience Store Decisions, to name a few. We’re proud of the commitment Alon Brands has made and will continue to make to the community and customers in Albuquerque. Congratulations, Alon Brands! The past six months have been VERY busy here at LPR. My LPR travels have taken me down to Austin quite a bit lately to work with one of our clients, Acumera, a growing technology company that provides network connectivity, security and visibility for convenience stores. 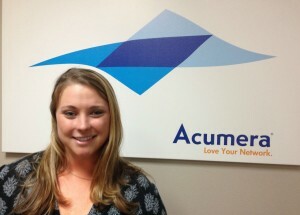 We’ve been working with Acumera since 2012, but they recently decided to up the ante with our relationship. They needed an internal marketing resource, but didn’t want to worry about the learning curve or overhead costs associated with adding a full-time team member. Since I’d been on the account for more than three years, I was able to jump in and fill the role, giving Acumera the benefits of having both an agency team and a dedicated “internal” resource to support Vice President of Sales and Marketing Tom Yemington. The whole experience has reinforced our philosophy that the most successful agency-client relationships are those that truly integrate agency team members into the client’s culture and business. It’s the best of both worlds. Here’s a quick video from Tom on why he decided to use a PR agency to support his marketing efforts. Despite the record-breaking rainfall in North Texas, the 2015 AT&T Byron Nelson drew thousands of golf lovers to the TPC Four Seasons Las Colinas Golf Course in Irving, Texas, for the four-day tournament last week. 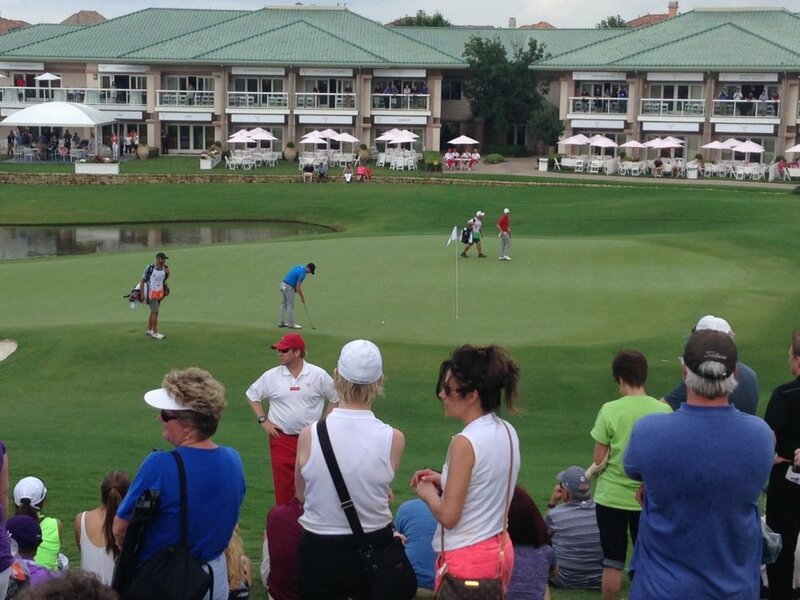 Spectators were eager to enjoy some beautiful weather (even though the sun only came out on Thursday and Sunday), see the classic "red pant guys" from the Salesmanship Club of Dallas and watch their favorite golfers, including 2015 Master's Champion Jordan Spieth. The Byron Nelson golf tournament provides an excellent Dallas venue for companies to rent villas or suites and invite clients and potential customers to enjoy food, drinks and golf. Our client, Infomart Data Centers, took advantage of the opportunity to entertain their clients by renting villa space between the No. 1 and No. 18 holes -- a prime spot on the golf course. I attended as event coordinator, making sure logistical aspects ran smoothly and coordinating merchandise giveaways to Infomart's clients. My hope is that the strategic public relations role -- which included big and small tasks -- I played for Infomart this weekend will positively impact the company's future business, partnerships and relationships. 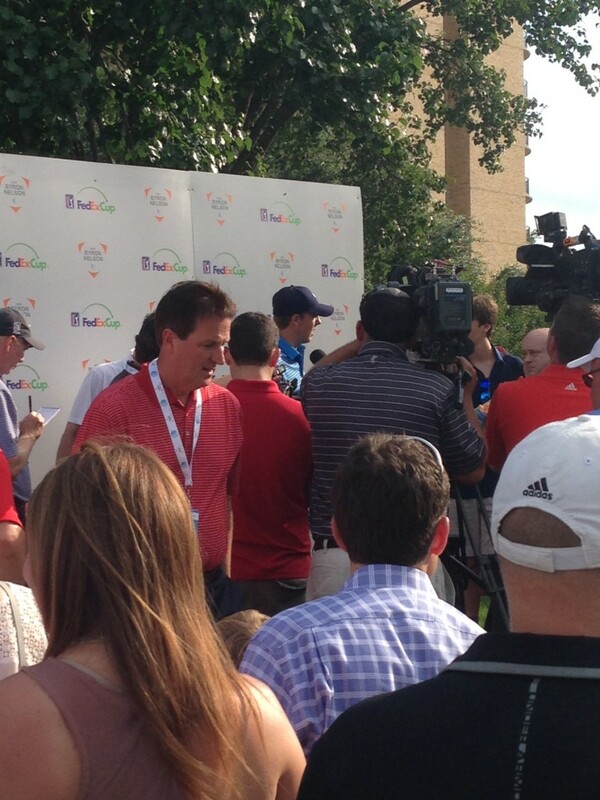 Plus, attending the Byron Nelson was not a bad way to begin my time as an associate at Lewis Public Relations. After nearly 10 years in public relations, I’ve seen my fair share of grand opening and ribbon cutting events. Giant scissors, mayoral proclamations, radio remotes, free samples…you know the drill. While it all sounds pretty simple, a well-executed grand opening event can be a very effective way to introduce a new brand, business or location to the neighborhood. The results can be even better when you get a little creative, which is exactly what the ALON/7-Eleven team did for a grand opening in Rio Rancho, N.M., last week. Since the new store was unlike any convenience store location the company had ever built, the grand opening had to be just as special. How did we help make it special? My day started off at the store at 5 a.m. sampling some new products and preparing goodie bags with fresh treats for the local media. ALON ordered these chocolate covered waffle cone cups straight out of Beverly Hills to help launch the store’s new coffee bar. DELICIOUS. 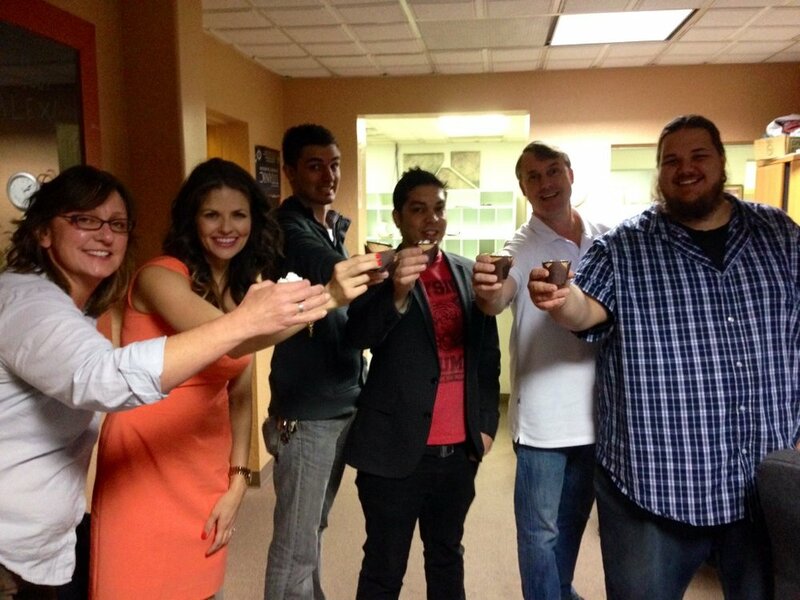 Then, I visited local morning shows to drop off samples and spread the word about our grand opening activities. Thanks to the KOB Good Day New Mexico team for letting me hang out at the studio for a while! We also did a few live shots from the store with KRQE reporter David Romero. But, the fun really started when customers began packing the store and the parking lot to try out new products, enter to win free gas prizes and visit our special guest, five-time Super Bowl Champion Charles Haley. The event was a ton of fun, but the best part is that thousands of customers came in to check out the new store during opening weekend. That’s the true measure of success. On May 21, Lewis Public Relations and our other Public Relations Global Network (PRGN) offices will be working to support Carrington College’s attempt to break the GUINNESS WORLD RECORDS™ for most blood pressure checks within an eight hour period. The American Heart Association calls high blood pressure a “silent killer” because it is typically symptom-free. According to the Center for Disease Control, 1 of every 3 adults in the U.S. has high blood pressure, but only about half of those 70 million Americans have it under control. To celebrate National High Blood Pressure Education Month, 17 campuses within the Carrington College network are partnering together to increase local communities’ knowledge about blood pressure and provide education about health risks associated with both pre-hypertension and hypertension. Kicking off Carrington’s Mesquite campus blood pressure check, there will be a special guest from the American Heart Association, located here in Dallas. As this theme directly correlates to its mission, Carrington College is excited to partner with this great cause! 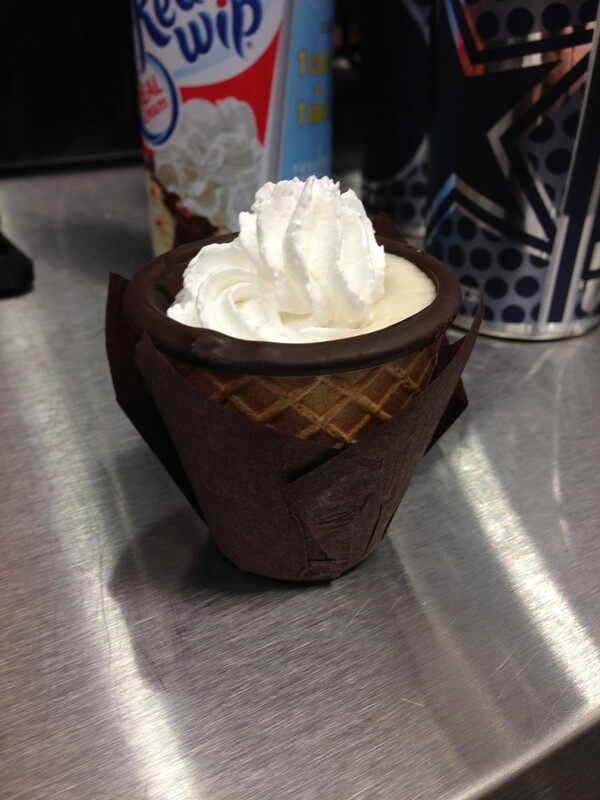 Come by to see us tomorrow between 1-9 p.m. at Carrington College, 3733 West Emporium Circle, Mesquite, Texas 75150. You can follow along with Carrington’s tracker for the event at CarringtonBreaksRecords.com. Also, check out what's going on in other markets with our partner PRGN offices in Phoenix, San Francisco and Seattle. Spread the word and educate yourself! Engage with Carrington College, #CarringtonBreaksRecords, and American Heart Association, #CheckItDFW. Will you help us break this world record? It may save your life! Lewis Public Relations (LPR), a Dallas-based public relations and strategic communications agency, announced that Infomart Data Centers – one of the largest data center companies in the nation – has selected LPR as its agency of record. In October 2014, Fortune Data Centers merged with The Infomart to create Infomart Data Centers, now among the globe’s most connected, carrier-neutral data centers. Infomart Data Centers reached out to LPR to assist in establishing its post-merger brand identity and advancing the company’s next generation technology story. Currently focused on four facilities across the country, including Dallas’ iconic Infomart building on Stemmons Freeway, Infomart Data Centers specializes in providing superior connectivity, unmatched performance and consistent reliability to its customers. In addition to Dallas, the company operates wholesale data centers in Portland and Silicon Valley, with a fourth location in Ashburn, Va., expected to come online next year. LPR will provide strategic messaging, media relations, industry analyst outreach and stakeholder engagement for the national Infomart Data Centers brand. “Because of the public relations and strategic marketing work we are already performing within the technology space and LPR’s relationships in the Dallas/Fort Worth media market, we’re the right match for Infomart Data Centers as they begin to define and tell their brand story,” Lewis added. About Infomart Data Centers Founded in 2006, Infomart Data Centers (formerly Fortune Data Centers) is an award-winning, industry leader in building, owning and operating highly efficient, cost-effective wholesale data centers. Each of its national facilities meet or exceed the toughest industry standards for data centers in all operational categories of availability, security, connectivity and physical resilience. Recognized for its consistent excellence, Infomart Data Centers is committed to maintaining its reputation of reliability and responsible, best-in-class management and operations. For more information, please visit www.infomartdatacenters.com or connect with Infomart on Twitter and LinkedIn. About Lewis Public Relations Lewis Public Relations is a Dallas-based public relations and strategic communications agency that applies strategic thinking and get-it-done capabilities to a broad range of client challenges and opportunities. Focusing on business-to-business communications, the team combines the knowledge and experience of a large, multinational agency with the agility and value of an entrepreneurial boutique firm. Visit www.lewispublicrelations.com to learn more, or find us on Twitter, LinkedIn and Facebook. Earlier today, EverittCo shared with clients and others that the firm would be merging with Aars | Wells. We’re all looking forward to continuing our collaborative activities in the coming months and years as trusted colleagues and friends. More importantly, we are wishing Mark, Alex and their employees all the best as they take two talented marketing firms and make them one.